The Data Protection Act 1998 concerns the processing of personal data. Any electronically held information relating to an identified or identifiable individual is personal data. 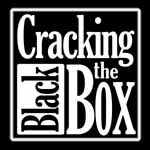 It is not easy to define exactly when an individual is identified, but identifying someone does not necessarily mean being able to ascribe a name and address to them. If a person is uniquely distinguished from all others within a relevant group, he will be identified. Without going into much detail, the document mentions "biometric" contactless chip ICAO standard passports, EPC Global RFID tags for the retail goods and warehouse logistics, so called "ubiquitous computing", and travel smartcards like the London Transport Oyster Card. Continue reading RFID data protection guidance from the Information Commissioner. "This EPCglobal Board Ratified standard defines the physical and logical requirements for a passive-backscatter, Interrogator-talks-first (ITF), radio-frequency identification (RFID) system operating in the 860 MHz - 960 MHz frequency range. The system comprises Interrogators, also known as Readers, and Tags, also known as Labels." This is the standard around which all the big electronics companies are producing their new RFID tag products, with promises of better, faster, more simultaneous tag reads per second, greater range etc. No Encryption of the data between the Tag and the Reader, apart from a 16 bit pseudo random number handshake which tries to hide the transmission of Password or Kill Codes. All the rest of the transmissions are in clear plaintext. Step 1. The Interrogator issues a Req_RN, to which the Tag responds by backscattering a new RN16. The Interrogator then generates a 16-bit ciphertext string comprising a bit-wise EXOR of the 16-bit word to be transmitted with this new RN16, both MSB first, and issues the command with this ciphertext string as a parameter. Step 2. The Tag decrypts the received ciphertext string by performing a bit-wise EXOR of the received 16-bit ciphertext string with the original RN16. An Interrogator shall not use handle for cover-coding purposes. An Interrogator shall not re-use an RN16 for cover-coding. If an Interrogator reissues a command that contained cover-coded data, then the Interrogator shall reissue the command unchanged. If the Interrogator changes the data, then it shall first issue a Req_RN to obtain a new RN16 and shall use this new RN16 for cover-coding. To reduce security risks, this specification recommends that (1) Tags use unique kill passwords, and (2) memory writes be performed in a secure location." 32 bit Password (in two 16 bit chunks) - no "3 bad passwords and you are locked out" - brute force Password attacks are feasible - watch out for the theft of high value or restricted items (e.g. military weapons) by being electroncally "re-labelled" remotely, invisibly and undetectably. 32 bit Kill Code (in two 16 bit chunks) - The specification suggests, but does not demand, that each RFID tag should have an individual Kill code. Since this implies a lookup to a central or distributed database, with all the logistical network problems that implies, many companies will be tempted to use a common Password and/or a common Kill Code on whole batches or product lines, increasing the risk of a remote, radio based, Denial of Service attack even through the walls of a warehouse or a sealed transport container. Better collision avoidance in multiple reader situations - implies lots of possible deliberate Denial of Service attacks on the readers, or spoofing attacks on the stock control systems which the readers feed into. Just like WiFi etc. - no authentication of the Reader by the RFID tag - lots of possible Man-In-the-Middle attacks, and there is no way for, say, item level Tesco RFID tags which have not been "killed" at the supermarket checkout till, to only be read by genuine Tesco operated readers, and not also by, say, Marks & Spencer ones, or ones operated by a malicious third party. Obviously, based on past experience, the actual product implementations of this standard, may have other privacy or security issues, in addition to those listed above. Please let us know if we are wrong in our interpretation of this standard. EPCglobal Generation 2 UHF RFID tag standard agreed - but no encryption ! This is the new standard for RFID tags favoured by both the US Department of Defense and the supermarket giant Wal-Mart for passive RFID tags working at Ultra High Frequencies of between 860Mhz and 960MHz. This promises faster reading of tags at greater ranges than the current generation of RFID tags which have been tested in various warehouse and, more controversially, supermarket shelf trials. "Compared to the existing weak 24 bit Class 0 and the trivially weak 8 bit Class 1 "Kill Codes" the proposal to have a 32 bit one must be an improvement, but whether this actually offers any real improvement in security from Denial of Service attacks or actually helps with Privacy is still open to question until the full specification and the alleged "secure communications between reader and tag" are explained." Continue reading EPCglobal Generation 2 UHF RFID tag standard agreed - but no encryption !. The transcript of the adjournment debate on Information Technology/Retail Crime on Tuesday 27th January 2004 is now available online via Hansard. "Radio frequency identification tags are tiny microchips, little bigger than a grain of sand, which can contain information from the price of goods in a shop to a person's entire medical records. They have been proclaimed as the global successor to the 30-year-old barcode, but they are much more sophisticated. They can not only store much more data, such as a product's expiry date, colour, packaging, origin and destination, but transmit it through the airwaves. Crucial to their operation is a microscopic antenna, invisible to the naked eye, which allows the chip to be read by a scanning device"
Whilst it is true that contactless smart cards and the more expensive, re-useable, battery powered active RFID tags might have enough memory capacity to store medical records or product details on the RFID tag chip itself, that is not the concept behind the ultra cheap, disposable Electronic Product Code "internet of things" passive RFID tags which are causing all our privacy worries, whilst promising a more efficient logistics chain. These have an individual serial number, and, in the more sophisticated ones, a "kill" code and/or password to deactivate or re-programme them. Any other product data etc. is stored outside the tiny chips themsleves in other computer systems, which use the EPC serial number as the key to look up the appropriate data, and to track the tag past each reader. "No one, least of all in retailing, wants negative responses from customers. That affords some confidence that retailers will not want to risk giving rise to the sort of fears that my hon. Friend mentioned. There has been one protest here, against the "Inform" project at Tesco. It was attended by four people?three adults and a child?suggesting that the great majority of customers recognise that the technology is being used to improve stock management rather than something more nefarious. " There were actually two protests outside Tescos, one in Cambridge where the Gillette razor trials were held and one in Sandhurst where the DVD trials were held. 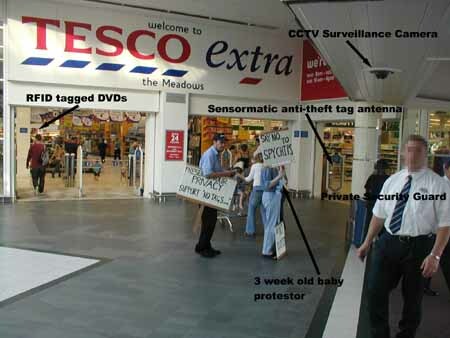 Due to the secrecy surrounding the Tesco trials, the vast majority of their customers had no idea that they were taking place, so claiming that these customers recognise anything about the technology is political spin. "Best practice examples are already emerging in the introduction of new technologies. Marks and Spencer, to which my hon. Friend referred, went to great lengths to explain to staff and customers what the trial of RFID tags on garments was about. All the tags were clearly identified and removed at the point of sale. Where the tag was attached to a wrapped item, customers were offered an alternative bag before leaving the premises. The tags could be read only with a Marks and Spencer reader." Although Marks & Spencer were much more open about their RFID label trial in their small High Wycombe store than Tescos, when we purchased an item from this store, we had to hunt around for the explanatory leaflets, and the RFID label tag was not removed upon purchase. It looks as if the National Consumer Council forum which Stephen Timms mentioned is on February 5th, but will be held in private under the Chatham House rule i.e. Marks & Spencer starts tracking tag trials"
Marks & Spencer seem to have tentatively launched their promised RFID tagging trial at their High Wycombe store. Unlike, Tesco, they do seem to be planning to at least give their customers a leaflet about the trial. The tags will not be embedded into the clothing (suits, ties and shirts) but will either be on a paper label (separate from the barcoded price tag) attached to the suit or tie, or stuck to the plastic packaging of the shirts. However, these RFID tags are still not in accordance with the supposed Auto-ID EPC tags which are meant to have the ability to be "killed" or disabled at the point of sale, which these do not. The effective normal working range of these M&S RFID tags will be much greater than those used (without any privacy problems) on reusable plastic food product delivery trays, as they will be working in the Ultra High Frequency range (somewhere above 868Mhz). Given the public relations silence on the topic so far, it must be assumed that this latest M&S RFID tag trial still does not seem to comply with the Auto-ID Center's idea of a tag that can be "killed" or disabled electronically at the checkout, and that there is no strong authentication handshake which would allow only M&S RFID readers to interrogate them. unless automatic systems for "killing" tags at the checkout are developed and tested at the outset, some accountant or manager will award themselves a bonus when they calculate that it will cost more in checkout staff time or customer queues at peak times, to "kill" a tag than to buy a new one. They will then try not to bother with tags that can be "killed" or will "save" on the equipment needed to do so, to the detriment of consumer privacy. Therefore, even though this M&S trial is no real threat in itself at the moment, our RFID tag privacy concerns (similar to those over "third party cookie tracking" profiles compiled from internet web site surfing) still remain. The NoTags organised protest at the Tesco Extra superstore passed off very amiably. Although not a huge threat to privacy at the moment, Tesco do deserve to be criticised for not informing their customers about the full implications of this and other RFID tag trials. c.f. our RFID webpage for more details and photos. NoTags are organising a protest at the Tesco Sandhurst store on Monday 15th September from 5.30pm. c.f. Re-scalable map showing the location of the Tesco Extra superstore in Sandhurst.